All you need is nine markers and a place to set them up. An arena with walls or a rail is nice, because there is more incentive to make the turns tight and clean so you do not run a kneecap into the sides of the arena. First set the markers or cones up like the black dots. The shorter the distance between cones the more difficult the exercise is, so if the horse or rider is green, start out with them a little wider. I recommend starting at a walk until the pattern becomes familiar, it is easy to get lost! Start at the center cone with it on your left. Follow the diagram continuing to make left turns until all the boxes have been “closed” and you finish at the center cone. Then move to a jog/trot, and then for a bigger challenge try it at a canter/lope. To go to the right, start at the center with the cone on your right, and continue to make right hand turns like the diagram shows, eventually ending at the center. One of the trickiest parts of this pattern is the long center line. Keeping them straight and forward is a challenge. At the canter some horses want to change leads going down the center. This exercise is for all riders, horses, and disciplines. It helps with control, timing, cadence, collection, transitions, concentration, and balance. It also keeps the nervous horse or rider busy, and it is a great way to achieve focus. Work at the walk and trot, and make your boxes more round. Concentrate on the pattern and keeping smooth, consistent, forward movement. Expect the horse to travel forward through the turns without a lot of help. Work mostly at the jog/trot and start to introduce the canter, maybe only one box at a time. Make the boxes rounded squares, which requires the rider to make the horse keep it’s shoulder up through the turn. Work this pattern at mostly a trot and/or canter, and make your boxes square. This teaches body control for the horse, and rider has to have good timing and feel to make the sharper turns. 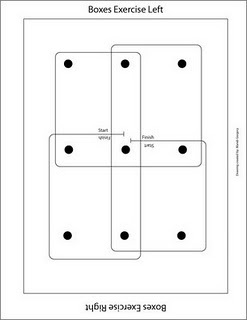 If you flip the diagram upside down then it is all laid out for the right hand turns.